In this page we will learn marshaller and unmarshaller annotation example with Castor in spring OXM. Castor is an open source XML binding framework. It allows to convert XML to/from java object. We configure CastorMarshaller as bean in our annotation based configuration file. If we are using any mapping XML file, we can refer it by using CastorMarshaller.setMappingLocation method. Castor provides castor.properties file to override its configurations using which we can achieve pretty printing of XML. We will provide here complete example and will start with the meaning of marshaller and unmarshaller. Marshaller : We convert java object into XML. Unmarshaller : We convert XML into java object. Find the software and tool which we are using in our development. Find our demo project structure in eclipse. In configuration file, we need to create bean for CastorMarshaller. CastorMarshaller.setMappingLocation() is used to refer xml mapping file. Using CastorMarshaller we create the instance for Marshaller and Unmarshaller. In this class we create methods for marshaling and unmarshaling . Spring provides two interfaces org.springframework.oxm.Marshaller and org.springframework.oxm.Unmarshaller. Marshaller interface defines the contract for Object XML mapping Marshaller and Unmarshaller interface defines the object XML mapping Unmarshaller. While writing to XML, we use StreamResult for file and while converting XML to java object we use StreamSource. We need to create a class which will be used to map object to XML and XML to Object. We can perform pretty printing while marshaling. If we need proper indentation of XML tags, we have to override castor.properties file keeping in classpath. To achieve pretty printing, configure org.exolab.castor.indent as true. 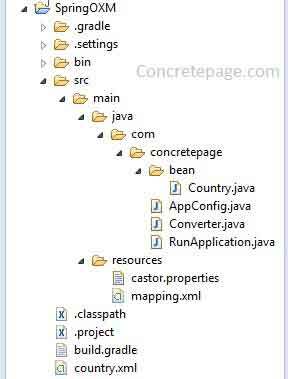 To get the control of creating XML and its node nomenclature and mapping java file properties to a XML attribute or element, we have to create a mapping file which will be configured with CastorMarshaller in configuration file. If we use node as attribute, then that property will be considered as attribute while mapping from java object to XML and if node is element, then that java property will be mapped as element in XML. Finally we will test our application. We will create an object of Country class and call marshaling method. That will generate an XML file as country.xml. After this, we will call method for unmarshaling in which we will pass our XML file name that will be converted into java object. Find the output for marshaling as an XML. Find the output for Unmarshaling in which we get a java object. 11:05:03.124 [main] DEBUG org.exolab.castor.xml.XMLContext - Creating new Unmarshaller instance.